The Vision of Faith Cares is to meet the spiritual needs of the people of Africa. To meet the physical needs of the poor, sick, orphaned and those afflicted by various natural disasters on the continent of Africa through the means of a support and aid organization. To network and administrate a number of aid organisations by providing an administrative infrastructure to such who share our common goal and vision. The ministry is positioned to make a significant difference in the ways and places ordained by God, to impact the needy by demonstrating the grace and love of Christ our Lord. The Mission of Faith Cares is to make a significant difference in the place where God has placed us by giving to others with generosity, grace and love through Christ our Lord. As God's servants our efforts are directed to relieve human suffering and to combat hunger, deprivation and physical affliction with the provision of food, clothing, shelter, medical support and other basic necessities of life. We are to facilitate the recovery and provision of short term relief and development assistance to economically disadvantaged people and victims of disaster in Africa. So many of our children walk long distances to school and are exposed to the elements. For this reason, we felt led to put a stop to this and together with you, our faithful partners, we will be able to do something about this. 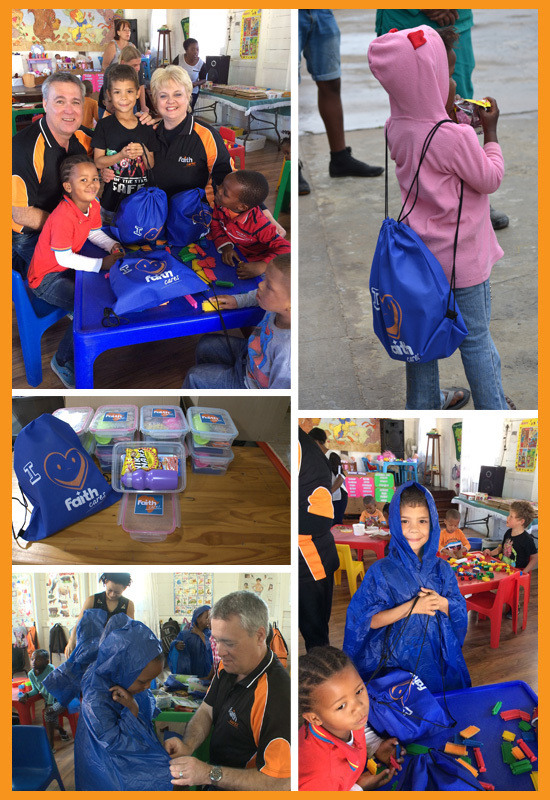 And that is exactly why we have put together our brand new project: Introducing the Faith Cares Summer School Project... which features an awesome Children's Poncho, a water bottle and a lunchbox, filled with snacks and cold drink concentrate. For your Donation of only R150, we will be able to supply one child with this quality bag, filled with goodies, including the Gospel of John. Partner with us, by taking our hands and let's invest in the next generation. Let's do our part in getting these ponchos, water bottles and lunch boxes into as many hands as possible and let’s make this new school year a year which they will forever remember! For more than ten years Faith Cares (formerly known as Siyanceda Africa) has been devoted to providing food, clothing, shelter, medicine and other daily necessities to the economically disadvantaged and victims of disasters on this continent. Faith Cares cuts across cultural barriers, travelling to rural areas, spreading the Gospel of Jesus Christ. Be a part of what God is doing through this Relief ministry. Our mission is to make a significant difference in the place where God has placed us by giving to others with generosity, grace and love through Christ our Lord. Please make use of the following account for your gifts and donations to support the ministry of FAITH CARES. 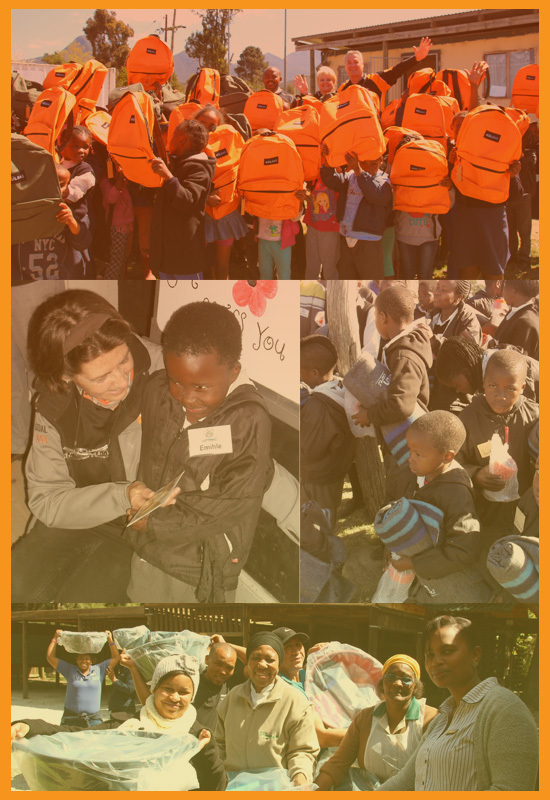 Faith Cares is registered in terms of Section 18A with the South African Revenue Service (SARS), which means that your Donation can qualify as a deduction for tax purposes. Should you wish to receive acknowledgement or a Section 18A receipt from FAITH CARES for your donation given, please be so kind as to fax or post your proof of deposit to our Administration Offices.